This Fieldday Contest was the first one OV-Bruchsal (A02) participated in club history – and we had a lot of fun! The idea was mainly driven by Markus (DK8TU), but it was easy to find a group of people who were interested to work in the contest. We used our old Contest-QTH (Michaelsberg) which is located 259m asl with a very nice view into the Rhein valley and a good location for HF as well. The weather was just fantastic, very hot and sunny, and most of us already had a nice sunburn before the first qso was made. We decided to participate in the restricted class with a maximum of 100W output. Therefore we used Alois’ (DL3IAC) TS-950S which worked very well during the contest activity. The antenna was a 160m dipole (15m above ground) driven with a ladder line and a simple antenna tuner. CT by K1EA was used for logging – this caused us some headache as the logging time wasn't always correct for reasons we don't know. Some others set up a 2m contest station with single Yagi, 17m above the ground. Their rig was a HF rig with tranverter and 750W amplifier. They needed a 10KW Diesel generator, so HF people had enough electricity. We started the contest on 15m with many JA-stations in the log. Thanks to the All Asia DX Contest! We also worked other DX stations (North America and Africa) and everyone was very surprised how good this simple station was working. 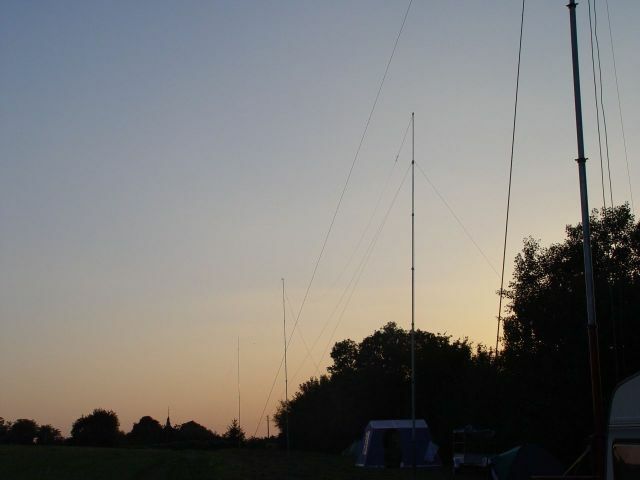 10m was almost closed, so we concentrated mainly on 15m – 80m. Even on 160m we made almost 100 QSOs. At midnight (UTC) we decided to check 20m again. And, what a surprise, the band was widely open to NA, SA and Pacific. So we catched quite a few more multipliers. We ended up with 703 QSO, 124 multipliers and 297.352 points, which was the 5th place in category EK. We are very sure that this will not be our last fieldday. So hopefully we will meet you and others in the next one!